Gayathri Prathapar (known as Gaya) is CPA (Australia), Associate Chartered Management Accountant (UK), Chartered Global Management Accountant, and Justice of Peace in the State of NSW. She is also a member of Australasian Legal Practice Management Association. Gaya started as the Practice Manager with Barwick Boitano Lawyers in November 2008. 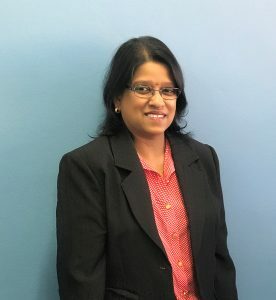 Gaya’s 12 years of experience within the Legal, Health and IT industries is a real asset to the practice, and she is a valued member of the team. Gaya brings a friendly welcome to the office as well as a professional client-focused work place. She is also fluent in Tamil and Sinhala. After work, Gaya enjoys quality time with her children.